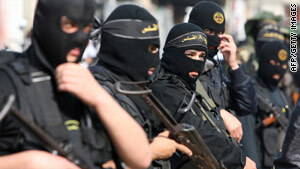 Islamic Jihad militants Monday attend the funeral of a comrade killed in Gaza on Sunday. Two others also died Sunday. Gaza City (CNN) -- Shells that landed in Gaza killed three Islamic militants Monday, Palestinian sources said. The shelling came a day after Israel's prime minister warned that the nation would respond strongly to attacks coming from Gaza, though the Israel Defense Forces denied involvement in Monday's incident. On Sunday, three Palestinians, described by the IDF as Islamic Jihad operatives ready to launch rockets, were killed. The dead included a senior commander who was known to be behind attacks via improvised explosive devices and gunfire, the IDF said. Monday's attack occurred just east of the northern Gaza neighborhood of Jabalya, the Palestinian sources said. At the start of his weekly Cabinet meeting Sunday, Israeli Prime Minister Benjamin Netanyahu said that 20 rockets and mortar rounds were fired at Israel from Gaza last week.